Advanced Makeup Course – JKFlashy Inc.
JJill K., is the Owner & Founder of JKFlashy Makeup Service, Inc., the first and highly regarded upon Makeup Service Company in Westchester County. Westchester Magazine, 914 INC., The Knot, Westchester Weddings, ENJOY, are some of the various publications JKFlashy’s work can be found in. Awards include Best of Westchester / The Knot Best of Weddings / Wedding Wire Bride’s Choice Awards / Wedding Wire Best of Weddings, numerous write ups in “Style Me Pretty” amongst other popular blogs. Jill K. has been featured on Channel 12 News for bringing together a significant number of high end vendors for a large scale photo shoot. Jill K. has been approached numerous times to teach Makeup, her craft, her skill & “inside secrets,” and has chosen to remain exclusive to teaching The Advanced Makeup Course at the New York School of Esthetics. Each Advanced Course is three weeks long & offered in the Day & Evening. Each Advanced Course is three weeks long & offered in the Day & Evening. 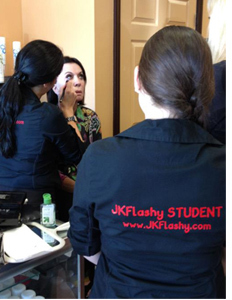 Students are encouraged to observe & receive “hands on” experience by “shadowing” outside of the classroom with Jill K.’s company, JKFlashy Makeup Services, Inc. Please email Jill directly for all details, Jill@JKFlashy.com. WHAT WILL YOU BE ABLE TO DO WHEN YOU COMPLETED THE ADVANCED MAKEUP COURSE? Apprenticeship opportunities may be available, during the school session, for a Highly Regarded Makeup Service Company in Westchester County / New York City. Working with some of the Top Videographers & Photographers in Westchester & NYC.